A secure and close relationship with your partner is critical to leading a happy and fulfilled life. Not surprisingly, when our relationship and marriage breaks down, we can experience immense emotional pain and distress that negatively affects all aspects of your life. Our Relationship and Marriage Counsellors can help rebuild your relationship. Our Marriage Counsellors, Karen, Toni, Tamera, and Raylene have 10+ years experience working with couples on the Gold Coast and they have post-graduate training in an evidenced-based couple’s therapy called Emotion Focused Therapy [EFT] for Couples. Emotionally focused therapy (EFT) is based on the concept that distress in intimate relationships is often related to attachment fears such as fear of abandonment or engulfment, and, an individual’s emotional response to these fears is often reactive and harmful to the relationship. When intimate partners are not able to meet each other’s emotional needs, they become stuck in negative patterns of interaction driven by ineffective attempts to get each other to understand their emotions and needs. EFT can help people identify and address their attachment-related insecurities and learn how to interact with their romantic partners in more loving, responsive, and emotionally connected ways, resulting in a more secure attachment and hence, a more satisfying relationship. If there has been a recent infidelity or “attachment injury”, we can help navigate these unchartered waters, and assist with the healing and recovery process – most often forming a bond stronger than before the infidelity occurred. EFT has been extensively researched and evidence shows that EFT therapy decreases distress within relationships, can mediate the effect of stress on the brain, and partners are able to interact in more successful ways. Follow-up studies show the positive effects of treatment continue for years after the therapy has concluded (Johnson, 2016). Coming to see a Marriage Counsellor for the first time can be a difficult first step, especially if someone is feeling ashamed about their behaviour in their relationship. Be assured that we take a non-judgemental approach, supporting both people in the relationship with their distress. The initial sessions focus on completing a comprehensive assessment of your relationship’s strengths and difficulties and your family histories. From there, we start to work on understanding your negative cycles of communication. 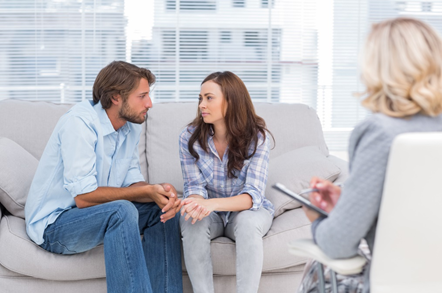 Therefore, we typically say you need to allow for 4 to 6 sessions of therapy before you make any definitive decisions about whether marriage counselling will work for you both or not. There is no specific referral required to see a Marriage Counsellor therefore all that is required, is to give one of our friendly staff a call and make a booking. For your convenience, we have after hours appointments available including evenings and Saturdays. If you have any questions about our marriage counselling process, please give us a call and we can arrange a time for a free 10 minute phone consultation with one of our marriage counsellors.